Industrial motor systems are the largest electrical end use category in the American economy. The reported energy consumption by the Census of Manufacturers found that energy consumption attributed to industrial motor system was 679,105 GWh/year and cost $23.4 billion in energy costs. According to the Department of Energy, the majority of energy use for industrial motor applications is dedicated to fluid transport and handling. In fact, pump, fan, compressed air, and refrigeration motor applications represent less than 40% of the population of motors in industry; however, this fraction of the motor population consumes approximately 61% of energy used by motors in all industrial applications. In particular, pumps and fans represent nearly 40% of all industrial motor energy usage. The performance of fluid handling equipment such as pumps and fans is sensitive to variations from the design condition. This is especially true of centrifugal equipment and their associated efficiencies, which encompass several, if not most, pump and fan applications. As it stands, it is common for most facilities to have motor driven fluid handling equipment that is not operating as efficiently as possible, and there is a great potential for savings in this area. The following recommendations outline the most common ways to save energy among various pumps and fans. These suggestions can vary between facilities, but are most often efficient ways to realize energy and cost savings. These recommendations include using cogged belts, variable speed motors, as well as utilizing appropriate sized pumps and fans. Standard V-belts utilized in most motors are usually subjected to large compression stresses when conforming to the sheave diameter. Cogged V-belts have less material in the compression section of the belt, thereby minimizing rubber deformation and compression stresses on the belt. By replacing standard V-belts with cogged V-belts, the efficiency of the transmission system is estimated to increase by 3%. In addition, cogged V-belts normally last twice as long as standard V-belts. Replacing all current motor belts at one time can be expensive. Therefore, it is recommended that standard V-belts be replaced with cogged V-belts as the current belts wear out in order to achieve an attractive payback. A variable speed drive (VSD; sometimes called an adjustable speed drive, or ASD) can be used to control the speed of the motors used in most fans and pumps. Variable speed drives allow the motors to consume less power when less desired output is needed. This improves the system's efficiency and prevents excessive energy losses at times of low demand. VSDs can be a serious investment, and may form a significant portion of initial costs. However, enough energy savings may be realized to justify the initial costs and result in an attractive simple payback. Process requirements may change over time, so pumps should be checked periodically to ensure they are using the minimum power needed for their current use. 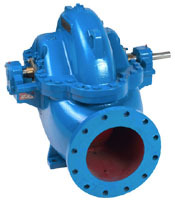 If necessary, downsize to pumps that can maintain the required baseline operation while using less power. Oversized pumps may result in excessive energy loss. Similarly, downsize fans if possible. If facility personnel use small personal fans to cool their workspace, consider replacing these fans with high-volume low-speed (HVLS) fans. Numerous small personal fans can collectively consume a considerable amount of energy. HVLS fans operate using low horsepower motors, and can cover large areas. The energy savings can be minimal by switching to HVLS fans, and may only result in an attractive payback if numerous personal fans are currently being utilized.